By most measures, the former dictator Muammar el-Qaddafi looks to have been overpaid, even as dictators go. Colonel Qaddafi’s wealth had recently been estimated in the tens of billions. But it now looks as though he could have been worth more than $200 billion. Obviously, $200 billion, or even $10 billion, is a lot for wealth for one person. But $200 billion is but a fraction of Libya’s national wealth. Its proven oil reserves alone total 46 billion barrels. If those barrels were valued at $100 each, the oil reserves alone would be $4.6 trillion, or 23 times Colonel Qaddafi’s wealth. In my research on dictators and their public finances, I estimate that, on average, dictators were taking about 3 percent of their nations’ incomes in the form of excessive taxation. Judging from Colonel Qaddafi’s share of Libya’s national wealth, that’s about what he was taking. Dictators typically spend a lot on the military in order to protect themselves from people who might want to take their lucrative jobs, which itself is a sure sign that a dictator is overpaid. Led by Colonel Qaddafi, Libya’s government spent more of the nation’s income on the military than the average dictatorship does. Libya also spent less of its national income on social security than the typical dictatorship does, although perhaps a bit more than an economically and demographically similar democratic country would. Colonel Qaddafi’s regime was known to torture and execute its political enemies. So it’s clear that the citizens of Libya were sacrificing too much for their leaders. What’s less clear is whether the next leaders of Libya will take less or offer better services for the citizens of Libya. Egypt’s experience since Hosni Mubarak shows that the overthrow of a longtime dictator does not by itself bring freedom or democracy. Libya has much more in oil riches than Egypt, and political opponents in Libya are likely to find that wealth worth a violent fight. Let’s hope that a long, bloody Libyan civil war does not make Colonel Qaddafi’s “fees” for his longtime leadership look cheap. On Wednesday I compared the household survey to the time dairy. Below are three more series, from the establishment survey. Are Employers Requiring People to Work Longer Hours? As employers have sharply cut back employment since 2007, at least one survey asserted that existing employees have to work a lot more in order to maintain what was produced by the formerly larger work force. The Census Bureau’s monthly household surveys do not suggest that such a pattern is widespread, because they measure that average weekly hours worked per employed person have fallen to 37.8 in 2009 from 39.0 in 2007. Another survey also measures hours worked, with a similar result. So it seems that the number of people employed and the hours they work have fallen, creating a huge drop in the economy’s total work hours. But sometimes surveys can be misleading about hours worked, because people tend to report round numbers like “40 hours” or “35 hours” even when actual hours worked are not a round number (more than 40 percent of employed people in the monthly household survey reported that they worked 40 hours in the reference week, compared with a mere 0.4 percent who reported 39 hours of work). It is logically possible that a number of employed people were working more hours in recent years, but continued to report the round number of 40. Since 2003, the Census Bureau has supplemented its population survey with the American Time Use Survey, dedicated to measuring time use. Participants in that survey are asked to account for all their waking hours in a specific day, listing various activities, including eating, watching television, working, traveling, caring for children and so on. The diary study therefore has no bias toward finding that masses of people work exactly eight hours every day for exactly five days a week. It would be interesting to know if the recent recession looks different when the economy’s work hours are measured from the diaries, rather than from the population surveys as the product of employees and hours per employee. The chart below displays the results. Eight calendar years are sampled, from 2003 to 2010. The blue line is based on the household survey and is an index (normalized to 100 in the year 2007) of the average number of hours worked by adults. It shows about a 2 percent increase in hours worked from 2003 to 2006. Hours worked were about the same in 2007 as in 2006. For each of the three years after 2007, work hours were significantly below the previous year. 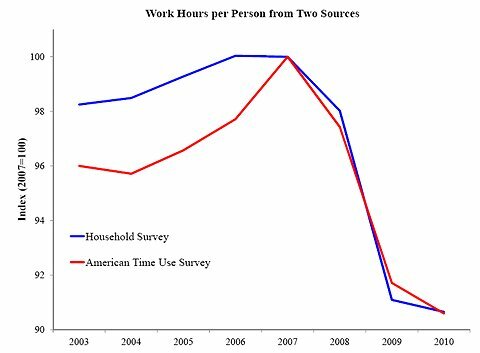 The red line is also an index of hours worked per person — but based on the time diary methodology (here I look at the sum of hours spent at work and in “income-generating activities”). The time diary actually suggests there was a mild recession in 2004, because hours worked per person were lower that year than in the surrounding years. Also unlike the household survey, the time diary suggests that work hours in 2007 were abnormally high by comparison with all previous years. The time diary closely agrees with the household survey measures for the years 2008-10, confirming that hours worked dropped sharply after 2007. Although a few employers may require their workers to work longer hours, the typical pattern since 2007 is fewer hours per employee, and fewer employees. In many industries, sharp employment cuts during the recession cannot be attributed to a lack of demand. The standard narrative of the 2008-9 recession and lack of recovery has been that the financial crisis, housing crash, excessive debt and other factors caused consumers to spend less, and businesses to invest less. With the private sector spending less, employers had a hard time selling their products, so they had to lay workers off, cut back on new hiring, or both. Yes, consumer spending dropped sharply, as did business investment, in 2008 and 2009. But that observation does not tell us whether low employment is a result of low spending or if the reverse is true. I agree that a few important industries, including manufacturing, home construction and much of the retail sector, did, and still do, suffer from significantly low demand. Those industries vividly illustrate the demand narrative — but they are only a minority of the overall private sector. The lack-of-demand hypothesis is incorrect for a large fraction of the economy. 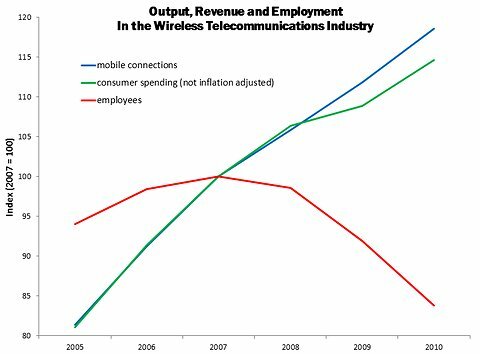 The chart below illustrates output, revenue and employment from the United States wireless telecommunications industry (that is, cellphones). This industry has clearly not been suffering from a drop in customer demand. Since 2007, the number of mobile connections has increased almost 20 percent, to 303 million from 255 million. The Bureau of Economic Analysis estimates that consumer spending on mobile communications increased 15 percent (not inflation adjusted) over that time frame. Despite continued demand growth, employers in the wireless telecommunications industry sharply cut employment, at an even greater rate than employers in other industries. After growing 6 percent from 2005 to 2007, the industry’s employment had fallen 14 percent by 2010. This pattern is not limited to the cellphone industry. Other industries sharply cut back their employment even while their revenues were falling little, if at all; the employment loss from such industries numbers in the millions. To examine this issue more systematically, I used the industry economic accounts published by the Bureau of Economic Analysis. Industries can be examined at varying levels of detail: I divided the private sector into 21 industries and classified them according to the percentage change in their revenue between 2007 and 2009. The table below shows the results. In two of the industries, education and health care, revenues grew more than 2 percent (in fact, their increase was about 10 percent), and their employment increased, as is shown in the table’s top row. Five other industries summarized in the next row had a revenue increase but still sharply cut their employment. Four others had minor revenue declines and cut their hiring sharply, too. The number of full-time equivalent employees declined 2.2 million in those nine industries combined, even though it seems that those industries had enough sales to maintain their employment. Something else motivated them to cut employment and motivated them to forgo an opportunity to hire some of the many workers laid off by declining industries. That’s why even growing business are now getting by with substantially fewer employees. The elderly are one group whose work hours now exceed what they were before the recession began. This pattern is most evident in the most depressed regions of the United States. The recession has varied in different regions of the United States. In some areas – including Arizona, California, Florida, Hawaii, and Nevada – housing prices surged more dramatically in the early part of the 2000s than they did in the rest of America, and their economies fell hard when housing prices collapsed. One view is that such areas experienced a deeper recession because their banks became overwhelmed with defaults and were unable or unwilling to make new loans to consumers and businesses. Without those new loans, demand collapsed more than it did nationwide, and jobs were especially difficult to find, even while people living in the area were especially eager to work. Absent demand, just about all workers will have a tough time retaining a job or finding a new one. Another view is that old loans are the problem, not newer ones. A significant fraction of households and businesses are typically so burdened with the debts they accumulated during the housing surge that they have little incentive to produce and work, because their creditors would get most, if not all, of the fruits of their labor. In contrast to the no-new-loans-and-no-demand theory, old loans do not affect all workers; some are less burdened by debt. The elderly may fall in this category, because they are more likely to have saved money over their lifetimes and to have paid off their mortgages. Although some elderly working for debt-burdened employers may have lost jobs, on average the elderly in these areas should be working more because they have better incentives to do so. The chart below compares 2007-10 changes in work hours for two areas –- the regions where housing prices rose and fell the most, on the left side of the chart, and the rest of the United States on the right. 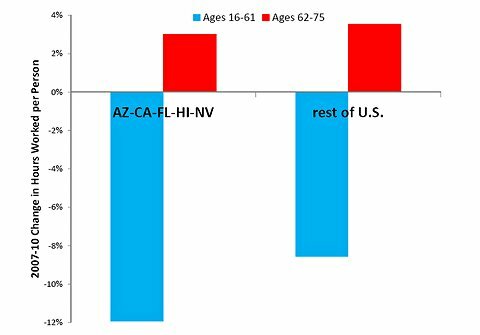 For middle-aged and younger people (blue bars), hours worked fell 12 percent in the large cycle regions and about 9 percent in the rest of the United States. Hours worked by elderly people increased in both regions. As I noted a few weeks ago, the average American elderly person worked more in 2010 than did the average elderly person before the recession began, even while work hours were down sharply for middle-aged and young people. The chart above shows that this is true even in the states that generally experienced the largest collapse during this recession. Demand is not the only factor driving employment patterns.